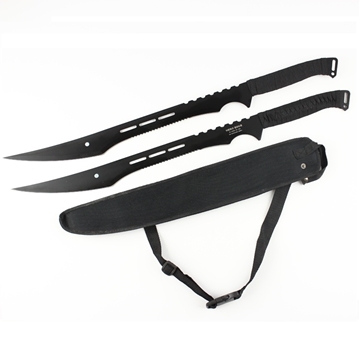 Full tang black bowie with karambit included! Black Legion's "Spectre Twins" have a nasty attitude, and when they throw a tantrum, all hell breaks loose. "Paternal twins," if you will, one is a bitter, talon-esque karambit and the other, a big, bad bowie. Both feature rock-solid, one-piece 420 stainless steel construction and are decked out in matching garb. Shimmery white nylon cord encircles the handles, affording a haunting, wickedly chic contrast with the black-coated stainless steel tangs beneath. 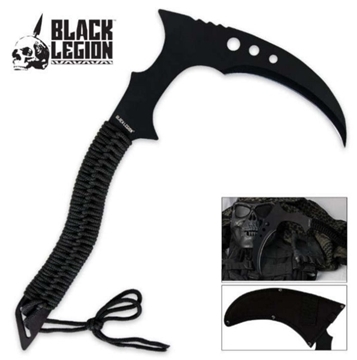 Like a bitter, savagely barbed raptor talon, the karambit blade is menacingly recurved and razor sharp. The karambit is perfect for one-on-one combat, with a distinctive, large finger hole pommel for strategic maneuvering and executing fancy moves. Though the karambit is no doubt potent, the bowie's ultratough build and impressively sized full tang blade makes it the serious muscle of the two. In addition to its carefully honed edge, the bowie boasts a row of sinister recurved serrations on its spine. The punishing barbs recall a giant python's hook-like teeth - once you're in its jaws, there's simply no escape! Each is a force to be reckoned with all on its own, but together, this rowdy twosome can really wreak some havoc! Despite their notorious tempers, you'll undoubtedly come to find you just can't live without the Spectre Twins and their unmatched cutting power in your arsenal. When conditions are at their worst, hazards at their most severe and circumstances at their most dire - that's when the Spectre Twins are at their best. 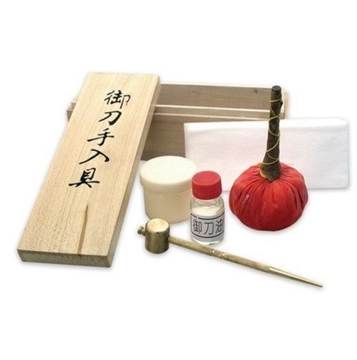 And they're the first knives you'll reach for when harrowing challenges come your way. 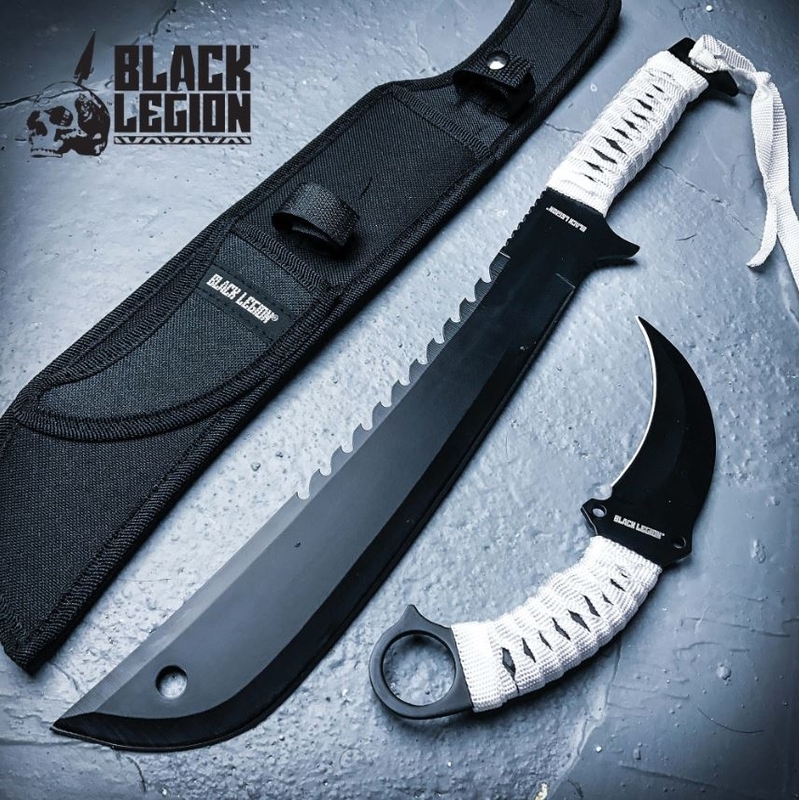 On the battlefield, in the wild, or even around the house or farm, Black Legion's dastardly "Spectre Twins" Knife Set proves its worth in any environment, time after time, year after year. 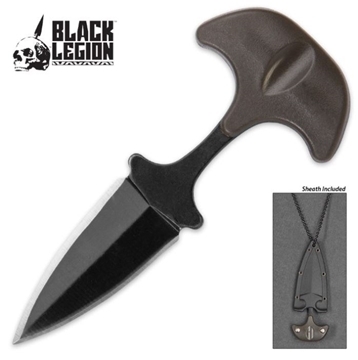 This neck knife is just the right size to carry around your neck each day so that you are always protected! It's fierce and mean so it has to be Black Legion.